3. 4PIN, and two Graphic card 6PIN interface, three interface optional. STABLE and SAFE: 4 Solid Capacitors deliver power to Graphics stably and safely. VER 009S: Version 009S riser kits are the newest and top of the line solution for setting up GPU mining rigs. 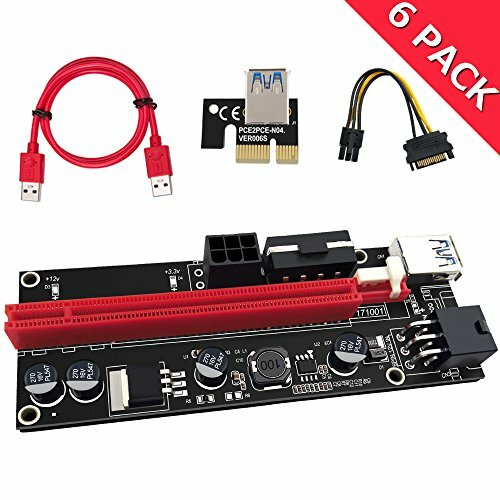 REDUCE MOTHERBOARD BURDEN: 4PIN, and two Graphic card 6PIN interface (two 6PIN interface directing differently) are optional to power, which provides Graphic card independent power and reduces motherboard burden when using more Graphic cards. WIDELY APPLICABLE: Suitable for all Window systems, LINUX and MAC. If you have any questions about this product by N N.ORANIE, contact us by completing and submitting the form below. If you are looking for a specif part number, please include it with your message.